FOR OVER 20 YEARS, APEX MORTGAGE CORP. HAS BEEN COMMITTED TO PROVIDING THE BEST FINANCIAL SOLUTIONS TO SMALL BUSINESSES BY CONCENTRATING ON ORIGINATING AND SERVICING LOANS. APEX Mortgage Corp. was established in December 1992 with a focus on providing commercial mortgages and loan programs directly to small business owners who are unable to obtain traditional financing. Our typical loan programs range from $25,000 to $1 million. In 2000 APEX became a wholly owned subsidiary of Firstrust Bank, headquartered near Philadelphia, PA. Since 1934, Firstrust Bank has been owned and managed by the Green family, who are dedicated to helping the communities they serve. Our commercial mortgages are held in APEX’s own portfolio and are never sold. As a direct lender of commercial mortgages, we believe relationships are crucial to helping business owners and real estate investors achieve success and we stand by you through the entire process. This allows us to fully understand and meet your business needs. With over 25 years of experience closing commercial mortgages, APEX takes a common sense approach to underwriting. We’re able to make decisions on commercial real estate mortgages and business loans based on the borrower’s entire story, not just the numbers on paper. APEX Mortgage Corp. offers a full array of commercial loan programs for self-employed applicants, including “no income verification” loans secured by both mixed-use and commercial real estate. 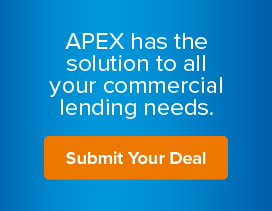 APEX Mortgage Corp. makes commercial lending easy—and quick! We can deliver credit approval within 24 hours. Underwriting can be completed in 48 hours. And settlement can be made as quickly as 10 working days from application. All commercial mortgages and small business lending is processed and serviced at APEX headquarters in Horsham, Pennsylvania. APEX conducts business in 42 states nationwide.